Red Couch Recipes: Blueberry Week -- Red, White, and Blue Salad/Girard's Dressing Giveaway! 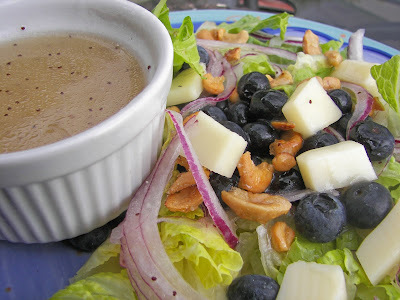 Blueberry Week -- Red, White, and Blue Salad/Girard's Dressing Giveaway! Don't miss the Girard Dressing Giveaway in this post! A food giveaway on a food blog; it doesn't get much better than that! Hope the heat, or the rain in our case, hasn't been getting you down! Today we had some wonderful thunder showers. It's Monsoon Season in Utah! It is not unusual for us to have very warm mornings and stormy afternoons. Here at Red Couch Recipes we are enjoying a glut of blueberries. My children eat them by the handfuls! 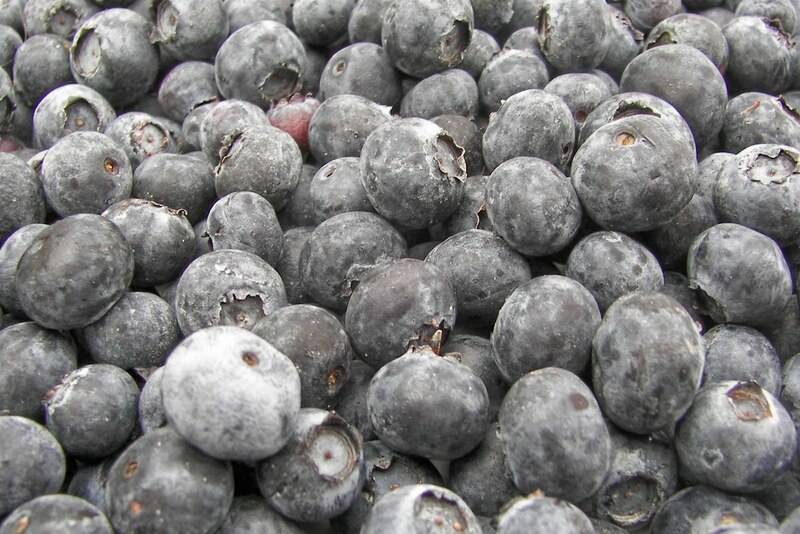 So what's a girl to do when she has a glut of blueberries, why BLUEBERRY WEEK of course! I was contacted by the people at Marzetti's to do a product review of Girard premium dressings. Marzetti is the parent company of Girard's. They sent me three bottles of their new dressings, Apple Poppyseed, Creamy Balsamic, and Peach Mimosa. and a fourth bottle of their signature Champagne dressing. The dressings I will review are Apple Poppyseed and Creamy Balsamic. I am reviewing Apple Poppyseed today and Creamy Balsamic next week. 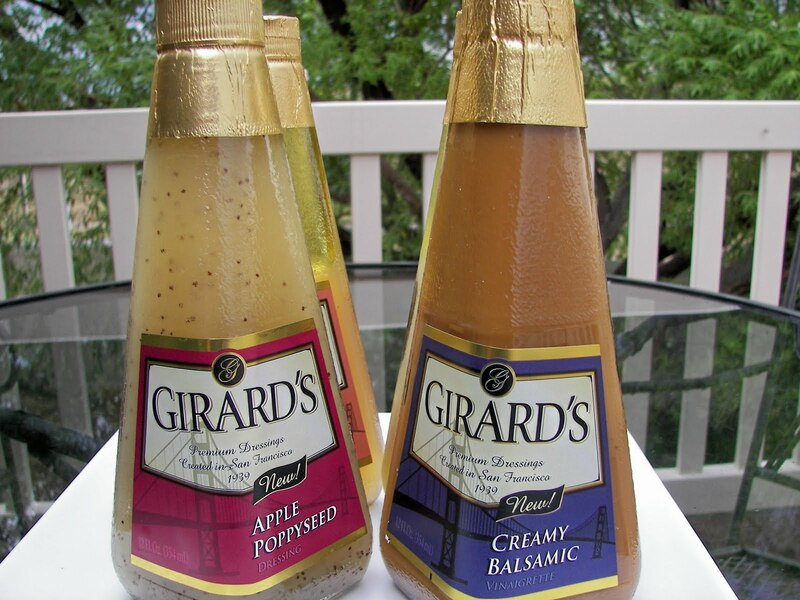 You have probably seen Girard dressings in the supermarkets; they have a distinctive triangular bottle shape. Chef Girard created his first salad dressings in 1939 in San Francisco. Girard's dressings come in 18 different varieties! The Marzetti company, have graciously offered me FIVE (four bottle) sets of their dressing for a giveaway to FIVE lucky followers of Red Couch Recipes! There are three chances to win. 1. You must be a a follower or become a follower of Red Couch Recipes and tell me, in a separate comment, that you are a follower for a First Chance. 2. In a separate comment, please visit the site Everyday Elegance , created by Epicurious.com and Girard's to feature wonderful recipes using Girard's Dressings and entertaining tips for a Second Chance. 3. In a separate comment, tell me that you blogged about this giveaway on your blog OR left a tweet and provide the direct link to your tweet on your comments for a Third Chance. 4. This contest is open to only those residing in the United States. 5. Your e-mail must be visible on your blog or in your comments to qualify for the giveaway. 6. One Salad Dressing Set Per Follower which consists of 12 fluid ounces of the following varieties: Apple Poppyseed, Creamy Balsamic, Peach Mimosa, and Champagne. This giveaway is being sponsored by the Marzetti Company. 7. The Giveaway will close at 11:00 pm (Mountain Time) on August 4, 2010. 8. Winners will be randomly drawn using Random.Org. The Marzetti Company has also provided a link where you can print off a $2.00 coupon towards the purchase of one Girard's Dressing. Click HERE for the coupon. Please be aware that there are a limited amount of coupons and that they are on a "first come-first serve basis. Today I made a salad to highlight the great flavor of the Apple Poppyseed Dressing. The Apple Poppyseed Dressing is sweet, but not cloyingly so; it is tangy, but not too bitey. 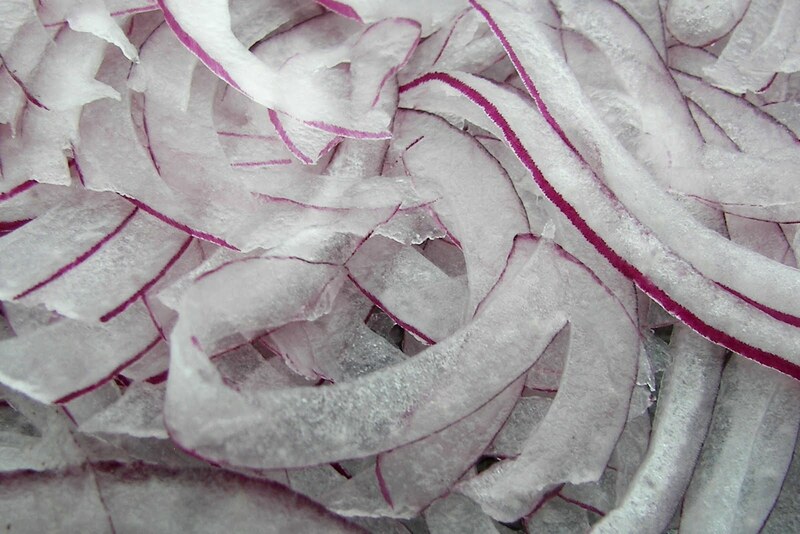 It enhances the flavors of the salad, but does not overpower them. 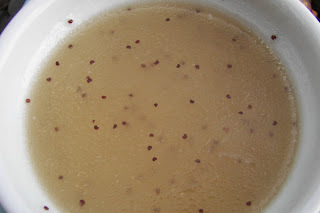 I have made similar dressings like the Apple Poppyseed Dressing, but mine have always come out too thin; this dressing is the perfect thickness. 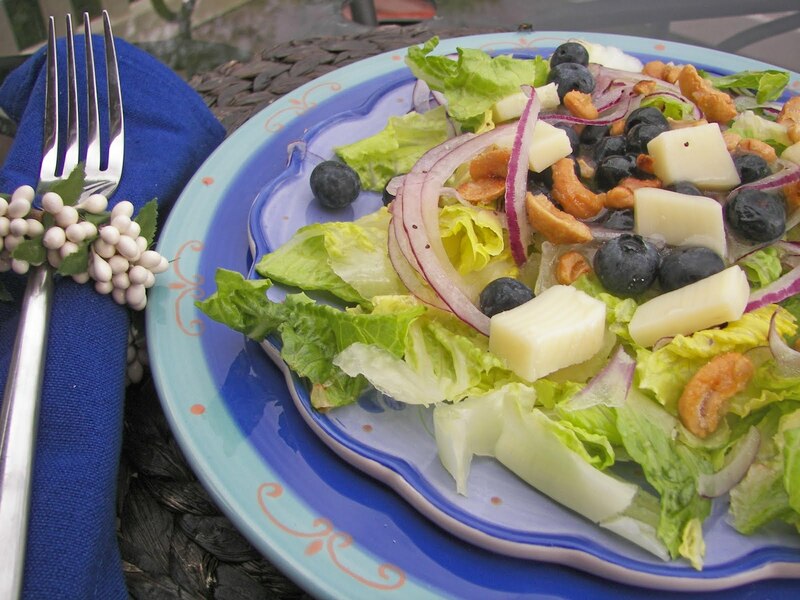 It enhances the flavors in the Red, White and Blue salad I have put together. Red Onions, thinly sliced. I use a mandolin -- "THE RED"
Sugared cashews -- Just throw some cashews in a small saute pan along with some sugar at a medium high heat for a few minutes. Watch carefully! 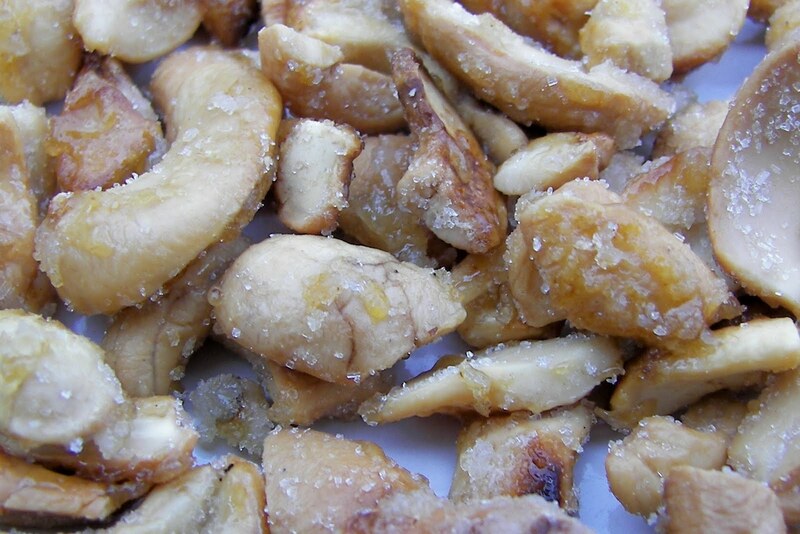 When the sugar begins to melt, take off heat and stir to separate the cashews from each other. Cool before using. Toss all ingredients together and then serve with Girards Apple Poppyseed Dressing. The Red, White, and Blue Salad is ready to eat! Come take a bite! Thank you for dropping by Red Couch Recipes, where you are always welcome to take a seat on my couch and relax a bit! What's for Dinner Mom Meatless Monday. Ooh lala! I love the CHampagne dressing but haven't tried the others! I am a follower! Everyday Elegance is a great website! I like their recipe for watermelon, feta and basil salad with balamic dressing. So fresh! 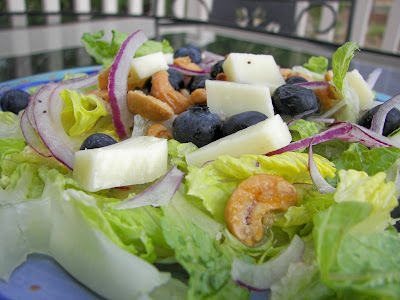 YUM- I love blueberries and we throw fruits in salads all the time! i do love girards champagne dressing..haven't tried the others...but i would bet they are good! Love the idea of throwing fruit into an otherwise savory salad....blueberries are my fave! The Shrimp Salad with Champagne Salad dressing at the Everyday Elegance site looks amazing! I think this is a great giveaway. I've never tried these dresssings. I am a follower. I visited the site...I'd love to try that shrimp salad made with the Champaign dressing. Hi Joni! Thanks for the fun give-away! I've been a follower! I've posted it on my side bar! I did visit that site, and the carrot/cabbage salad looks great! Your salad sounds delicious. I do love blueberries! Hi Joni, I wanted to stop by to thank you for popping over to my butterfly post and leaving such a nice comment. I love meeting new bloggers with similar (and not so similar sometimes) interests. The opportunity to critique food products sounds so interesting - and your pics and descriptions are wonderful. I'm a new follower now and look forward to stopping by often! Ciao, bella! Hi again, for some reason the Followers link box is not loading up on my page. I'll try again later!! Those dressings look amazing...apple poppyseed...Yum! Yum! I *love love love* blueberries and will definitely be coming back for the rest of blueberry week! You might be interested in my <a href="http://1sentencediary.wordpress.com/2010/07/27/tasty-tuesday-blueberry-oatmeal-bread/><strong>Blueberry Oatmeal Bread</a></strong> too. It is delish! I am a follower! These dressings look fantastic!! They all look great! Thanks! I checked out their website and actually bookmarked it to check it out again! Their dressing sound fantastic! The recipe I would LOVE to try would be their Savory Apple and Sausage Bread Pudding. It does not sound calorie friendly but SOOOOOOOOO delicious!! Thanks again for a great giveaway! Salad looks delicious and so does the dressing!! Now following!! I know first hand how great these are...I, too, am in the middle of one of their giveaways. Such fun...and these are REALLY great dressings. Yum!! I am a follower! I went to Everyday Elegance. I love the recipes over there. The watermelon salad looks good and the peach dressing looks divine. Thanks for a chance! Oh, these look fabulous! Our little groceries only carry the champagne and caesar, I'd love to try the apple poppyseed. Please add my name for a FIRST Chance! I am a follower of your blog and would so love to win those wonderful dressings. I just visited Everyday Elegance. Some wonderful suggestions there to spice up some summer sandwiches. Thanks for the link! I love blueberries and that salad looks delicious. I'd like to try those new dressings. Thanks for the giveaway and I'm a follower.